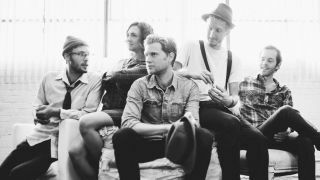 The Lumineers: "Our live sound is a lot bigger than our album," says Stelth Ulvang. ACOUSTIC EXPO 2013: Everyone and their grandmother knows the words to Ho Hey by Colorado based folk rock band The Lumineers. Taken from their twice platinum, self-titled album, that song propelled them squarely into the mainstream. With folk music advancing on the charts, too, it seems as though arranging acoustic guitar with additional instrumentation is ever popular. We spoke to The Lumineers guitarist, pianist and mandolinist Stelth Ulvang for some advice on how to go about it, as well as some general bio and band chit chat. How did you get into playing guitar and mandolin? "My mom got me a guitar for my 14th birthday and actually got me a mandolin for my 24th birthday. It broke. I got into mandolin while I was trying to sail from Hawaii to Seattle. Learning mandolin was the only thing to do other than sail. Anyway, I was much worse at sailing. Seasick and stuff. Ugh. But I did learn Wagon Wheel [Bob Dylan / Old Crow Medicine Show] pretty early on. And [18th century folk song] Shady Grove." Out of guitar and mandolin, which is your favourite to play? "I'm not the most talented mandolin player but I know my way around a guitar fairly well and prefer to play that. I travel with one everywhere." What is your favourite Lumineers track to play? "Ain't Nobodies Problem on the reissue. I'm playing an upright piano, but my mandolin and guitar playing is similar: emotive, ragged and rhythmic." What guitars and mandolins do you own? Do you have endorsements? "I have no endorsements - it's easier to play instruments we like on our terms with no strings attached. Actually, I just got a beautiful old parlor Washburn from the Chicago Music Exchange. And I have finally settled on Collings as one of the best mandolins on the market." What features do you look for when choosing gear? "Something that, like an instrument, physically resonates with you. Guitar and mandolin both need to resonate with your body as you play it." In a typical Lumineers set, what instruments do you use? "Well, I'd like to point out that I don't play on the Nord [keyboard] as everyone else does - I prefer the Korg SV1 for a keyboard. I like our Collings mandolin too and I've been playing Martin guitars." When writing a song, do you start off on guitar, mandolin or piano? "It's either guitar or piano. I've written one song on mandolin but it doesn't provide as strong of a base to stack more on top of." What's your advice for arranging acoustic guitar with mandolin and piano? "Don't try too much and pick the most honest parts. Start with the basics, record when you are feeling it, and use those specific sounding additional instruments like mandolin, banjo and accordion sparingly and wisely." When preparing a live set, do you change those arrangements much? "Our live sound is a lot bigger than our album. Our album has a lot of space in it, which is still important to remember as we are playing with five people."